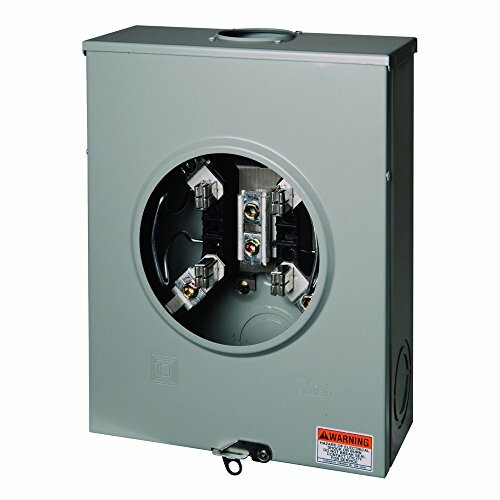 The square d 200 amp residential ringless meter socket with horn bypass surface mounts to provide for a single electric meter. It accommodates multiple wiring configurations for a size hub provision in the top end wall and a 2-1/2 in. Maximum knockout in the bottom end-wall. The meter main uses an aluminum bus, is single phase, three wires, and features a nema 3R rated enclosure for outdoor use. This unit is ansi certified and ul listed for use as service entrance equipment with a maximum load of 600 vac max. This 4-jaw meter socket is compatible with #250Mcm connectors maximum line and load conductor and neutral.